At A Cloud Guru we're a big fans of Serverless and automation. We're excited to see more people building Serverless applications. An Alexa app using Lambda is a great way to get started. Most people are a long way from being 100% Serverless. We want to help those people become Serverless. Our project takes inspiration from Chaos Monkey. It is a skill that terminates EC2 instances with Alexa. If you received an Amazon Echo Dot at AWS re:Invent, this is a great project to get started with. The Alexa integration uses AWS Lambda to handle Alexa Skills kit requests. The Lambda function processes skills request from Alexa. 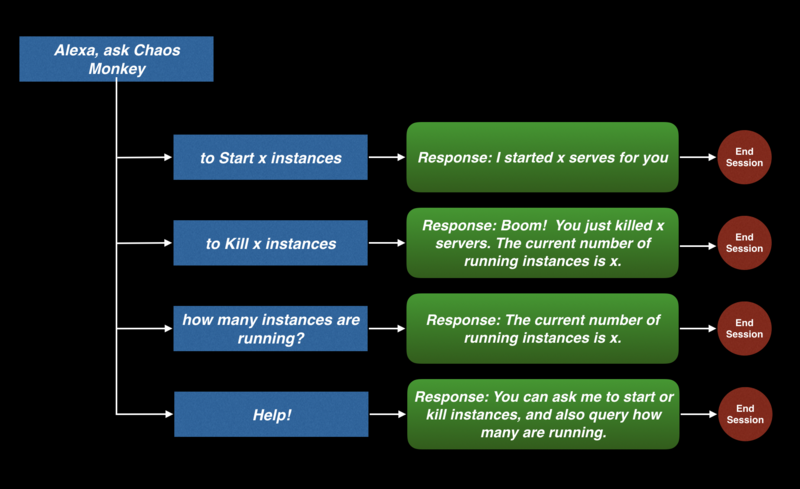 The function calls Lambda functions in the Chaos Service to perform actions based on the intent. We created a dashboard to allow people to visualise EC2 instances. The dashboard is a React app with a GraphQL backend on AWS Lambda. The Lambda function calls the same functions in the Chaos service to process requests. This architecture is an example of the Backend for Frontend pattern. This pattern allows us to use the same logic for the Alexa service and dashboard. Alexa identifies our chaos skill using the chaos monkey keyword and that our intent is to kill servers. We also configured a slot to allow the user to specify that they want to terminate five servers. In our intent handler checks the Count slot and terminates instances. The chaosService library invokes the terminate instances Lambda and returns a result. In the chaosService we use the aws-sdk to terminate random instances. We used the same approach to support starting and counting instances through the Alexa. 2. Follow the instructions in each README to setup your environment. 2. Deploy the Dashboard Service using ./deploy dev and get the API Gateway URL. 3. Update the the GRAPHQL_ENDPOINT in nwb.config.js and run nwb build . You should now be able to start servers, count servers and delete servers at whim. Please be careful. We take no responsibility for any chaos this may cause. You can find all the code on Github. If you have suggestions or improvements please go and add an issue there. A GraphQL Backend for the Chaos Dashboard. Invokes the Chaos Service based on the GraphQL queries. In a world of servers in the cloud, I do the needful.